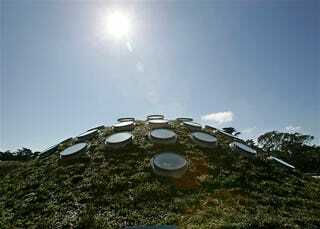 Over the weekend, the newly-revamped ecotechtural marvel known as the California Academy of Sciences opened its doors to the general public in San Francisco's Golden Gate Park. Packed with new, high-tech exhibits and massive tanks showing off slices of the coastal ecosystem, the museum is a monument to eco-consciousness on every level. From its living roof (pictured above), to its "flooded rainforest" walk-in tank, it's a must for visiting. Or just gawking at. We've got some photos of the most breathtaking parts. Last year, as the "living roof" to the museum was being built, journalists were allowed to visit and take pictures. Here is what the roof you see above looked like just as it was being planted in 2007. Below, visitors to the museum opening look upward at the flooded rainforest exhibit. And here, you can see upward yourself and find out what they are gaping at. Those blobs of light you see are the skylights that dot the living roof. So you are actually looking upward through two biosystems: a flooded forest, and a grassy California plain on the roof. The museum has retained its old shape in front, and many of the beloved exhibits are still there. The albino alligator (and indeed, several other alligators and cute penguins) hang out in an open-air habitat that visitors can peer into delightedly. Or fearfully, if the alligator happens to move. They sacrifice content (books/exhibit space) for architectural splendor. Yes, very airy and spacious, [but] where are the anthropology displays and award-winning dioramas? Guess all that went the way of rows of stuffy specimen cases. These days it's more about interactive displays thinly disguised as video games and touch screens. Still, he says the museum still has a lovely but small library open to the public, filled with reference stacks and taxidermy cases for the nineteenth-century-minded. And, he adds, "The Phillipine coral reef and Northern California coast tanks are big time show-stoppers." If you're in San Francisco, be sure to check out the new California Academy of Sciences. It's right next to the newly-revamped DeYoung Museum, which looks like something out of a Mad Max movie — all rusting steel towers. So the green Science museum makes quite a contrast with it. Definitely makes a day in Golden Gate Park feel like a battle between two futures. California Academy of Sciences [official site] Photo of 2007 living roof under construction by David Paul Morris/Getty Images. All other images by Paul Sakuma/AP.